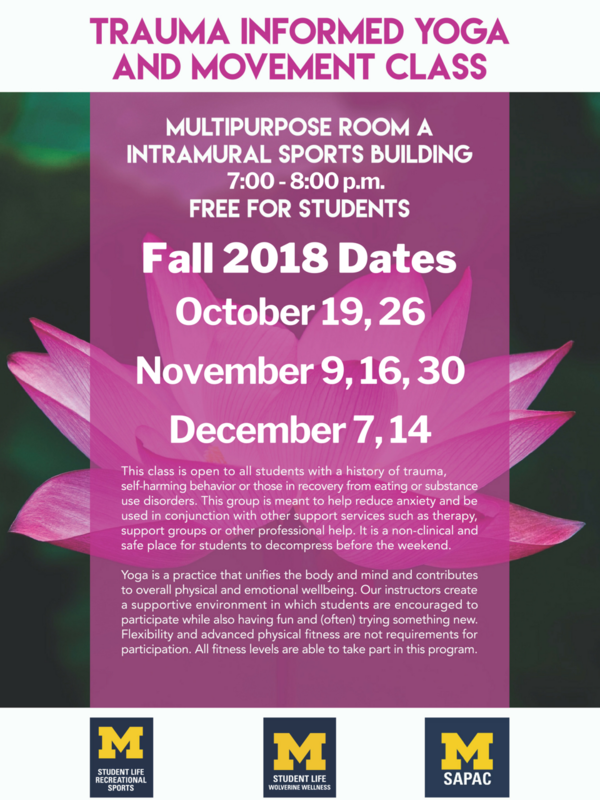 This class is open to all students with a history of trauma, self-harming behavior or those in recovery from eating or substance use disorders.This group is meant to help reduce anxiety and be used in conjunction with other support services such as therapy, support groups or other professional help. It is a non-clinical safe place for students to decompress before the weekend. Yoga is a practice that unifies the body and mind and contributes to overall physical and emotional wellbeing. Our instructors create a supportive environment in which students are encouraged to participate while also having fun and (often) trying something new. Flexibility and advanced physical fitness are not requirements for participation. All fitness levels are able to take part in this program.